Are you tired of seeing your floor messy and full of clutter and debris? This attractive boot tray is the perfect solution! The Venetian Bronze Squares Boot Tray is essential this winter, and it can make a wonderful gift for just about anyone on your list! Constructed from galvanized steel for added durability, the raised squares on this boot tray is designed to help wet items dry more quickly.Since the antique bronze finish is sure to match almost any decor, the Venetian Bronze Squares Boot Tray can be placed in your mudroom, entry, or any other area of your home. It is designed to accommodate several types and sizes of boots, umbrellas, winter accessories, or even multiple potted plants. 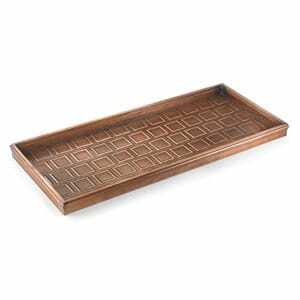 While we cannot prevent our home from acquiring dirt, mud, or snow that gets tracked in after hiking, shoveling snow, gardening or other messy activities, with the use of Venetian bronze squares boot tray, we can contain the mess and get organized at the same time. Give this durable boot tray as a Christmas present this holiday season and give your loved ones something they will truly appreciate!